"The Bible runs as little as $49.95, and we have three plans on it. Cash, COD, and also they have a little Catholic Honor Plan. Which plan would be best for you, the 'A', 'B' or 'C?'" No occupation quite captures the essence of America like the salesman. Capitalism depends on convincing someone to buy your wares, whether or not they actually need them. The need to succeed pushes those in the trenches to launder the truth as need be, though they somehow manage to keep rationalizing their less-than-ethical practices to themselves, largely in the hope of getting ahead in life. The Maysles Brothers and Charlotte Zwerin, best known for Gimme Shelter, made a major name for themselves with this, their first feature documentary film. 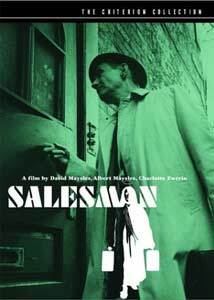 The Maysles follow four door-to-door Bible salesmen in the mid-1960s as they try to make a living in wintry Boston and another town north of Miami. Paul "Badger" Brennan, Charlie "Gipper" McDevitt, James "Rabbit" Baker and Raymond "Bull" Martos try everything they can to get reluctant Catholic housewives to sign on the dotted line. As necessary, they turn on the Irish charm, talk to the kiddies, build up the man of the house and outright lie in an effort to move their grossly overpriced merchandise. The film eventually focuses on the Badger, Paul Brennan, as his losing streak reaches disastrous proportions. Although the others initially are willing to try to help him out, they soon start to distance themselves from him, lest they start to lose sales themselves. Before long, he's a virtual pariah and mocked by his buddies in front of customers. This film is quite moving in its presentation. Paul is just as doomed as Willy Loman, busting his hump to make a living but just spinning his wheels. While we feel sympathy for him, and root for him to succeed, at the same time we are horrified by the people upon whom he preys. They are almost uniformly people who can't afford to buy these books with enormous price tags. Clearly undereducated and underemployed, when he does make a sale by capitalizing on their faith, there's not much joy there: he's literally taking food out of children's mouths to put into his own. As such, this is one of the most damning indictments of capitalism, in the raw, one is likely to find. Shot guerrilla style, with mostly natural light, Salesman has an immediacy that is gripping. It's amazing what the Maysles were able to manage here, not only getting these salesmen to let them film their pitches, but the people into whose homes they intrude allow them go ahead with the presentation as if a motion picture camera and tape recorder with a Bible salesman were the most natural things in their everyday lives. Part of this is the successful nature of the salesmen and their ability to assess quickly what their marks' weak points are and to get their attention and hold it fast. This is part of the Badger's problem, as he starts to lose his cool with the pitches and even becomes nasty and hostile to some prospects unwilling to buy. This feeds in on his sense of failure, creating a whirlpool that will inexorably drag him down. Perhaps most interesting, though, are the non-pitch sequences, such as Paul's calls to his wife back in Boston, where all she can talk about is how he shouldn't drive so fast. Not only is he isolated from his ostensible friends, he is hardly relating to his wife on any sort of meaningful level. In contrast, the sales conferences where their superiors give pep talks and try to encourage them to go out and make money, are some of the few moments that we see someone actually talking to Paul on a serious level, but even then he's hardly listening. He's wrapped up in his own inabilities and making excuses for himself. While the general thrust of the film is pretty depressing, there are moments of humor that brighten up the proceedings, such as the mark who puts on a warbly tape of an elevator music rendition of "Yesterday". It's kind of a relief to know that there really aren't any door-to-door Bible salesmen, manipulating the faith of the impoverished, around these days, but maybe that's because they've all gone into televangelism or siding sales or time shares. We can't really say that we've come very far, can we? Image Transfer Review: It's hard to give a grade to this, because the conditions under which it was shot are going to limit the source materials exceedingly. Only in one instance is there visible frame damage, lasting about 2 seconds. There is, as to be expected, heavy grain. Blacks are surprisingly deep and rich. The contrast levels are good, allowing plenty of detail without washed out highlights. I find it hard to imagine this looking much better. Audio Transfer Review: The sound is a 1.0 mono that is quite good. Noise and hiss are quite low and the dialogue is almost always clearly audible. Background sounds are often present, but suitably in the background. There's no music except what's playing in the scene, but that comes across as well as is to be expected. It does the job. Extras Review: Criterion provides a wealth of extras on this release. Most notable is a well-edited commentary with Albert Maysles and Charlotte Zwerin. They comment on the making of the film, dealing with the salesmen, their reactions to some of the sales techniques and the reception of the film. Zwerin notes that no one ever asked her how she turned 100 hours of film into a 90 minute movie, but then frustratingly she doesn't really answer that. I suppose I can forgive them for not knowing where the nickname "Gipper" comes from. A very nice period extra is a 31m:17s interview with Albert and David Maysles on CBS' Camera Three program in 1969. This goes into a good deal of depth as to the motivations of the Maysles brothers and what they were hoping to accomplish. Happily, it does not duplicate the commentary except in some very minor regards. The two provide an intriguing perspective on Albert Maysles' attitudes toward the film, in how they've altered and remained unchanged, over the intervening 30 years. An 11m:27s radio interview on NPR with James "Rabbit" Baker shows that until he retired recently, not much really changed with him, other than what he was trying to move. Filmographies are provided for the Maysles and Zwerin, and the package is wrapped up with nearly 100 stills and behind the scenes photos. It's left unclear who the heck was taking these pictures if Albert was filming and David was taping the sound. An extremely moving look at the life of the Bible huckster, shot with immediacy and a sense of reality that exceeds the usual documentary. A wide variety of extras help make this one an excellent addition to the collection.